It takes six months to fall in love with a partner, but just 30 minutes to fall in love with your pet, according to new research. Researcher of the nation’s dog owners has discovered us Brits really are a nation of animal lovers, with more than half (56 percent) believing they felt true love for their pet within half an hour. However, when it comes to our human relationships, the majority of those quizzed said it had taken up to six months to decide that their partner was “the one”. 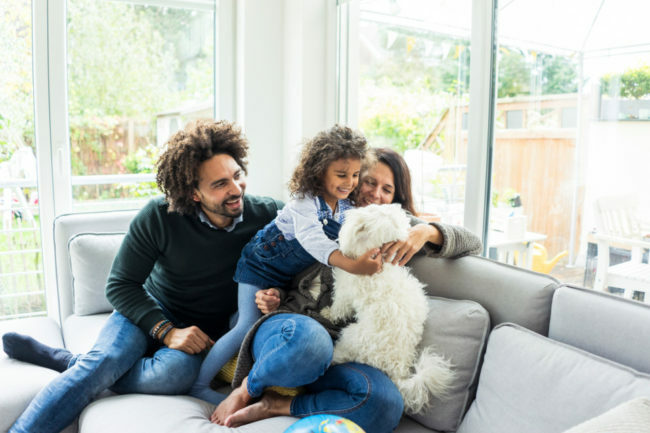 Four in ten (40 percent) of those surveyed by Agria Pet Insurance said they would describe the moment they met their pet as love at first sight, while only 16 percent could say the same about their other half. Agria Behaviourist and Trainer Carolyn Menteith, who helped with the study said: “It’s not surprising that so many of us believe in love at first sight as most dog lovers know that feeling when we meet a dog and our heart just melts. “One of the reasons we have such a great relationship with our dogs is because of the unconditional love that they are so good at giving – and that we so often don’t get from others in our lives. “Statistically speaking, the relationship we have with our dogs is more likely to last longer than our marriages, and so choosing our canine partner wisely couldn’t be more important for a long and happy life together, as is responsible dog ownership. “Each different breed and type of dog has different requirements and so you must select a dog whose needs you can meet. When choosing a canine companion, it’s important not just to think “Is this the dog I want?” but “Would that dog want me? “There are benefits to buying both a puppy or a rescue dog. With a rescue dog, what you see is what you get. “You know what they’ll look like, what their personalities are like, and have a good idea of what they are going to be like to live with. Almost 34 percent (18 percent) said they bonded with their dog in under five minutes. In fact, more than a quarter (28 percent) of the people polled said they would prefer to share their bed with their dog rather than their partner. Two thirds (66 percent) said that they class their dog as their best friend in the world, while 64 percent added that they actually prefer their dog to humans. The survey of 2,000 pet owners also found that 53 percent of people cuddle up with their pooch on the sofa yet only 36 percent would snuggle up with their other half. More than a third (37 percent) said they put their dog’s needs above their own or their partners, while only 35 percent would put their other half’s needs first. Two thirds (67 percent) said their dog showed them attention and unconditional love the instant that they met, but despite this 42 percent of owners don’t have pet insurance for them. Simon Wheeler, Managing Director of Agria Pet Insurance, said: “It’s heart-warming to see how much people care about their pets, they really are a part of the family. “But what’s alarming is that nearly half of the UK’s dog owners don’t have pet insurance – so their four-legged best friend could be in real trouble should they need expensive or long-term veterinary treatment. From February 1st to March 31st, Agria is making prioritising pets’ health easier than ever with their ‘Healthy Start’ campaign. Customers taking out a full policy with Agria will receive £50 to spend on anything with their vet that supports their pet’s health, such as vaccinations, dental checks and puppy packs. For further information and advice on choosing a reputable breeder, adopting a rescue dog, or buying the right puppy to suit you and your family, please visit here.